While the tide might be turning on the use of infographics by journalists or bloggers, we can imagine they’re still pretty popular among social media users. Especially when the topic of the infographic is you. With the new Facebook-powered app, GetAbout.me, you can generate three pretty cool infographics about you and your social network entourage. To get started, the first thing you’ll have to do is grant the app access to your Facebook profile. If you want to generate all three available reports, GetAbout.me has thrown a bit of like-gating in the mix. If you don’t like the idea (see what we just did there?) 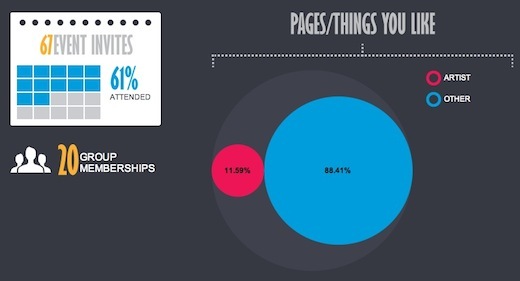 of having to add GetAbout.me to your Facebook pages, you can simply generate an infographic that details your last 12 months on Facebook. 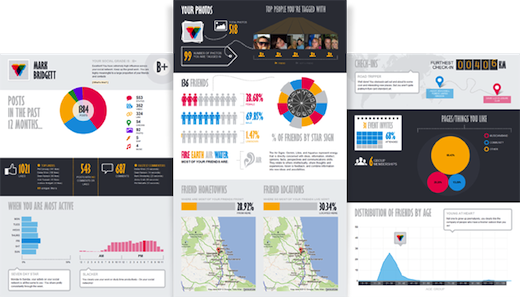 Information which appears in the first infographic includes the number and types of posts you’ve shared and who your most engaged friends are. In other words, the infographic will let you know who’s stalking your profile, leaving a comment within seconds of your new posts. It also shows you which days of the week and what time of day your most active on Facebook. Now if you don’t mind having your arm twisted to get a couple of more infographics, and are willing to hit the like button, you’ll also be able to generate a report that shows you a little bit more about you and your friends. Information appearing in the second infographic includes how many photos you’ve been tagged in and who is doing most of the tagging. 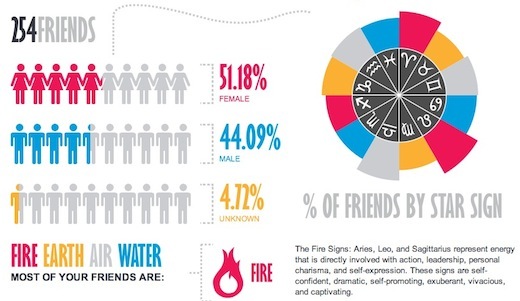 It will also give you a bit of insight into your Facebook friends – the male to female ratio, star sign percentages, and friends’ locations and hometowns. The final infographic will appeal to the narcissist in you, giving you even more details about what you’re up to on Facebook. Information includes the number of checkins, groups you’ve joined, pages you’ve liked and events you’ve attended. It also shows you the age range of your Facebook friends. Now that you’ve generated all that interesting information, you might want to share this with your friends or with the public. This is where there are a couple of features that could use some tweaking. To make your results public, you get to share a link with all of your infographics, but at the same time, the app also automatically shares a couple of posts with your Facebook friends, including one listing which of your friends make an appearance in the infographic. While we find this a little bit annoying, when granting the app access to your profile, you can make sure that GetAbout.me doesn’t spam your friends by simply selecting the option that only you can see posts made by the app. After the post has appeared on your timeline privately, you can then decide what you want to do with it. It’s also worth noting that GetAbout.me’s infographics cannot be saved to your computer. If you’re looking for other easy ways to generate infographics, be sure to check out Visual.ly‘s public service, which just launched last week, or if you’re in a creative mood, take a look at this guide on how to create one yourself.